A dear friend brought to my attention recently a competition on Talent House (collective of artists and competitions for artists to show off their work). The competition was to design a shawl for Stevie Nicks. Never have I been more excited to start a project! So I did some research and pinned some ideas on Pinterest. Then I got going. After I wove the main piece of the sample I decided on I took it off the loom and started planning out the details of the embellishments I planned on making to the main body of the scarf. Time was getting short and finally I changed my mind one last time and decided to embroider using stumpwork techniques (which was nearly back to my original plan of needlelace work). From there is all started falling into place. 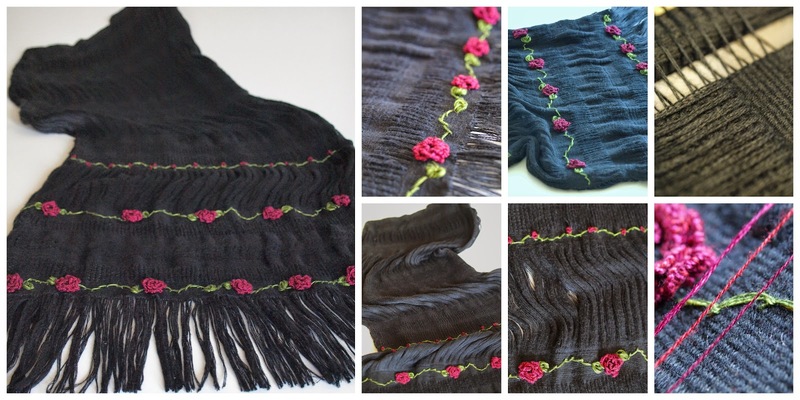 This shawl is inspired by fairy tales, dreams and enchantment. I imagined this piece after reading how much Stevie Nicks was inspired by fairy tales. I decided to take our common love of the tales and create a unique piece using my additional passion for traditional cottage crafts like weaving and embroidery, which often play an important role in fairy tales. Beauty and the Beast is one of my favorite stories as I love the romance and purity of the message in the story. The idea that beauty can be found in everything really was a theme I took to heart. The shawl catches the dark mystery of Beast in the handwoven black cotton threads. The soft and voluptuous threads are woven in stripes of alternating weaves. In between the woven horizontal stripes the threads are loose and open, this gives the shawl freedom of movement. Not only does the piece flutter like a crow’s wing, but the occasional glimpse of flesh (or color) as sections open and whisper across the arm and back hints of a great secret beneath. The delicate beauty of the rose Beauty requested from her father in the fairytale has been recreated and hand detailed with rich deep red and green embroidery threads. 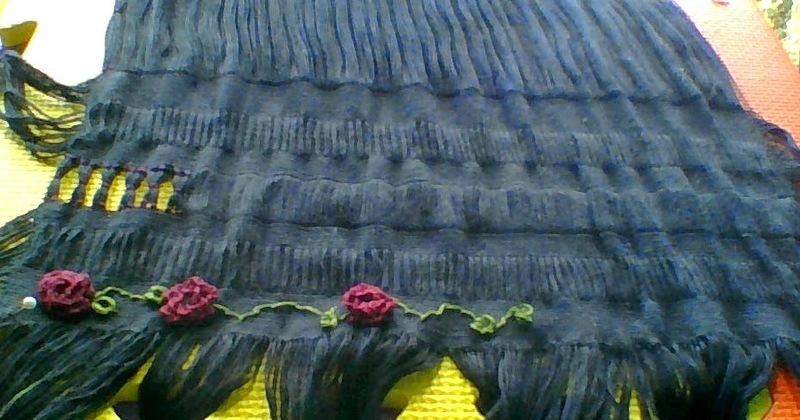 The vibrant lush colors of the embroidered roses and leaves are the visual foil to the darkness of the shawl. They soften the darkness while making it all that much more imposing. As a whole the piece weaves a picture of romance and love and which I think is what Stevie Nicks embodies. The piece if created will be 18” x 66” woven in black cotton with horizontal woven stripes alternating with ‘open’ sections of vertical threads. 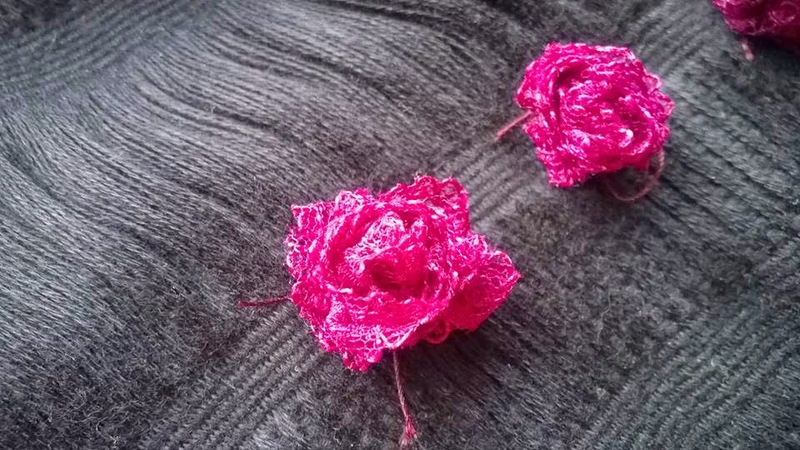 There will be three lines of hand embroidery running the length of the 66 inches: one half inch line of rose buds and vine; and two one-inch wide lines of roses and vine with leaves. If you'd like to vote for my submission and to see the other submissions please do. Other pieces of my finished work can be found in my Etsy shop or join me on FB if you want a chat or to see more process photos.